Making a positive impact on the world around us… that is the goal of anyone with even an ounce of altruism coursing in their veins. At least, it's my goal… one I highly value. 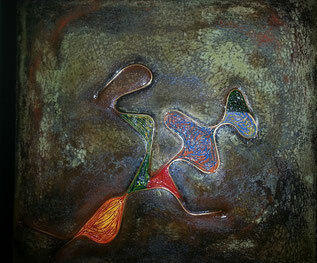 I'm an artist and I work with concrete, recycled copper and acrylic paint. Like any self-respecting artist, I try to bring value into this world through the works I produce. To "earn my keep", I've learned to diversify my activities by offering Team Building Workshops based on the visual arts… I call these Collective Art Projects (CAP.) Of course, we all know that creativity is not the exclusive property of the artistic world. Still, through these CAPs, I invite people into my world with the hopes that the experience will foster creativity in theirs…. whatever that might be. These "Special Projects" are extremely rewarding to me and I believe that the resulting works of art are many times more meaningful and valuable than any I could possibly produce on my own. One project completed this summer was particularly rewarding. As it invariably does, the story starts by me picking up the phone and call on businesses offering my "Teambuilding" services. On this particular call, as I made my "pitch", the client (Debbie McLaughlin), asked me if I would do this for a pre-wedding party. In fact, she told me that this would make a great gift for her new husband, Guy. She confessed that she had no idea what to get him. Then we met to discuss the details of the party to be held four days later. This is where it gets really interesting to a point where mere money completely loses its attraction. In the interim, she had to take her mother to a palliative care center. One of her sisters, Bonnie, decided to stand guard with her mom. So when I showed up at the party, you can imagine that the bride-to-be was not in as festive of a mood as I expected her to be. Looking at the expression on her face, I thought the wedding was off or I got canceled… or whatever. Then she filled me in on the details. She then asked… this is where it gets truly special… if I would be "kind enough" to visit her sister and her mom and have them bend their piece of copper so we could include them both in the collective art project. Of course, I immediately accepted to do it. The funny thing is, she thought I was doing her a favor. I told her it would be an honor for me to do this… and it was. I visited the mother and daughter at the care center around 7 PM. She died the next morning around 3 AM. Wasn't that amazing! The very last thing my client was able to do with her mother is produce a lovely work of art overflowing with positive emotion… now that's a POSITIVE IMPACT! I'm just happy to have had the honor to be part of it. This story serves to underline an important point; whether we are a doctor, a public servant, a politician or an artist… I believe we are here to add value to the world in whatever capacity we have. And whenever we have the opportunity to do this, it should be treated with dignity and respect for others. The price we charge for goods/services we provide is a starting point… not the endgame.